Demonology is a subject far removed from the average modern consciousness. Demons and the constant war against them may be considered the stuff of wild fantasy by moderns, who have forgotten their own history and replaced it with a superficial culture based on the popularization of laboratory science as a substitute for truth-conveying mythos; but it has been an integral part of every culture in the past. Modern people, knowing nothing of demons, are powerless against them. Why do you think popular culture is so full of dark, distorted and morbid themes? Why do you think "mental disturbance" has reached epidemic proportions? Folk tradition throughout the world is full of rituals to drive away bad spirits. Gargoyles on churches parody evil imps (using that term in its literal sense) in order to keep them away. Ancient buildings had labyrinths painted on their doors that dark spirits might become lost in them and unable to enter. One could fill pages with examples of how so very much of the daily life of older cultures was concerned with the matter of demonology – the combating or keeping at bay of evil spirits. But I am sure every reader can supply her own. Humanity has always been the enemy of the demons. The very words "Satan" and "fiend" simply mean "enemy" (in the Semitic and Germanic languages respectively). But the worshippers of Our Mother God, the people of Dea, are most especially the enemies of the demon. For us, demonology must hold a position even more vital than it does for other traditional peoples. 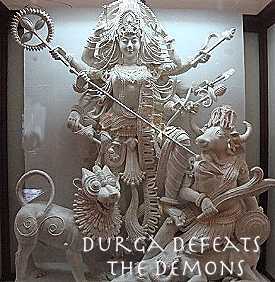 When the worship of Dea as Supreme Mother, beyond all "gods", was restored to India in the Middle Ages, the first Scripture of that restoration was the Devimahatmya – the story of the Great War against the demons in which Dea as Sai Vikhë ( Durga) was utterly triumphant and literally saved the world. In the Motherland, Sai Herthe, the supreme myth of the present Aeon is that of Sai Rayanna who defeated the demons and established the current Imperial Era. Demons are far more prevalent in Herthelan culture and literature even than in older Telluria. Why is this? Because the Vikhelic principle, the struggle between light and dark, is an essential part of manifest life. Sai Vikhë is after all one of the seven Principles of all manifest existence. However, after the patriarchal revolutions in Telluria, people began to kill their own kind and war against each other. The Vikhelic principle was misdirected and the Enemy (Satan, Fiend) often became other Tellurians. As late as the "world wars" of the 20th century the association of the human enemy with the true Enemy continued. Every German soldier in the First World War had the words Gott mit uns (God with us) emblazoned on his belt-buckle, while pulpits on both sides rang with preachings of the righteousness and Godliness of "our" cause and the dark danger of the enemy. Patriarchal literature from epic to opera, from comic book to blockbuster, turns on acts of violence, murder and warfare. In Sai Herthe, the Vikhelic aspect of life is supplied by demonology. Maids do not commit deadly violence against other maids, but demons ever threaten human life and can even sometimes possess human bodies. If a Tellurian were to see Herthelan literature she might think it demon-obsessed. A Herthelan seeing Tellurian literature would find it obsessed with a crime so strange and unnatural as to be positively bizarre – the killing of human creatures by their own kind. Conflict is in the nature of manifest creation. Only when there is discord is the First Element of Aethyr divided into the four material elements. If perfect equilibrium were restored, the manifest universe would no longer exist, but would be one with the Supreme Principle again. Thus, maid – the central being of a given world – has an Enemy and it is her part to triumph over that enemy and preserve light and goodness. Thus in any world free from the confusion of patriarchy (under which the enemy appears to be another portion of humanity), demonology and the spiritual Holy War (as opposed to material warfare against each other) is central to human existence.